The Young and the Restless (Y&R) spoilers tease that the mystery surrounding the J.T. Hellstrom (Thad Luckinbill) case continues to deepen. Since there are still so many swirling suspicions and questions, now’s a good time to reevaluate the story and consider where it will go from here. Y&R has been telling quite a tale, but there are some important things to keep in mind. For starters, we should note that storylines can be adjusted. Certain plots get dropped or changed all the time. Remember when Cane Ashby (Daniel Goddard) got a random knee injury and was addicted to pills for a few episodes? Y&R quickly brushed that under the rug and went in a different direction. Likewise, Tessa Porter’s (Cait Fairbanks) story about what happened in Canada never entirely added up. It felt like Y&R was going to explore more there and potentially reveal something that had already transpired. Tessa gave flimsy excuses for why she was out of touch for almost a month and erased the security tapes after her attack. She seemed to be leaving out a few crucial details. However, The Young and the Restless eventually dropped that angle and made Tessa the blackmailer. It was a wise decision since it gave the main J.T. story a necessary jolt and brought Mariah Copeland (Camryn Grimes) into the equation, but it may not have always been the plan. With the bigger J.T. mystery, there’s no guarantee what Mal Young, Y&R’s former head writer and executive producer, originally wanted is still going to play out. Things have gotten awfully messy, so it’s tough to say at this point. Regardless, they’ll hopefully remember what we know so far. The show’s been known to give contradictory clues – like when Tessa drew attention to Rey Rosales’ (Jordi Vilasuso) charity suspicions knowing full well she had just blackmailed those women for $250,000. It made no sense for Tessa to raise red flags for Mariah. Then again, it also didn’t make sense for Tessa to stash the remaining $230,000 in her closet and invite Mariah to “get creative” to make her stuff fit. Y&R characters aren’t always the brightest! Nevertheless, Tessa looked incredibly guilty. There was a suspicious shot of her after the cover-up crew declared that something was coming. It was mentioned that she brought the mail in just before the blackmail letters were delivered. She ended up with a bag full of money. It was so obvious that many people suspected she had to be red herring, but Y&R didn’t deliver any major twist. Is that going to change with the conclusion of the J.T. storyline or will they take the obvious route here, too? An alive J.T. still fits all the facts. His body is missing and a security expert like him would have the skills to pull this off. Katie Abbott (Sienna Mercuri) also referred to her special friend as a “he,” so that works as well. J.T. would have access to his own blood for the planted shirt. He’d have the dirty clothes that were found in Nikki Newman’s (Melody Thomas Scott) bed. He’d know about the fireplace poker. Nick Newman (Joshua Morrow) and Victor Newman (Eric Braeden) now suspect J.T. could be alive, but that doesn’t rule him out. As we’ve established, sometimes the obvious big reveal is the right one. Plus, Victor isn’t wrong very often! Sharon Newman (Sharon Case) expresses doubt about Nick’s theory in Wednesday’s episode, so Y&R is kind of playing both sides here. 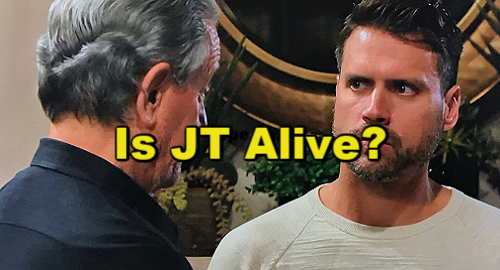 It seems the real mystery has become about J.T.’s survival. Is he alive or not? If J.T. isn’t to blame, who else could be behind this shocking scheme? The Young and the Restless spoilers say the excitement’s about to rev up, so don’t miss the bombshells ahead. Are you eager to see the end of this long and winding storyline? We’ll give you updates as other Y&R news comes in. Stay tuned to the CBS soap and don’t forget to check CDL often for the latest Young and the Restless spoilers, updates, and news. The Young and the Restless Spoilers: Y&R Surprise Couple Swap – Sharon With Billy and Nick With Phyllis?